The Netherlands sells itself as a country of tulips, windmills, cheese and clogs, but that is not how international workers see it. In Ready, Steady, Go Dutch, a new book by DutchNews.nl and volunteer organisation ACCESS showed clogs don’t merit a mention. Nor do tulips and windmills. But mention bikes, doctors and the lack of sunshine and you will find international workers have plenty to say. 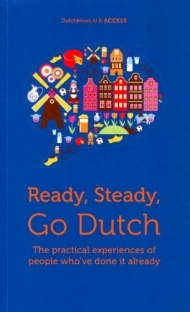 Divided into 10 short chapters and with a list of extra information resources, Ready, Steady, Go Dutch takes the reader through the ups and downs of relocating to the Netherlands, learning the language, finding a job and a home, and making a new life. Doctors, shops, the weather and of course cycling are all dealt with in bite-sized quotes from people who have already made the move. Some of the comments are unexpected, some are amusing or poignant and some highlight the differences in expectations and experiences between different nationalities. Together they form a snapshot of the expat experience in the Netherlands which everyone can learn from. In particular, the relaxed atmosphere in the Netherlands, especially at work, is a big plus for international workers. The work environment is relaxed. I saw people cancelling meetings just because it was sunny that day, said one Turkish expat. I love the fact that where I work there is less emphasis on hierarchy and more on consensus and delivery, said a Russian national who has lived in the Netherlands for nearly nine years. And an American expat was quite certain about the impact of working in the Netherlands on her work-life balance. I will never go back to a country where I only get one week’s holiday a year, she said. Dutch houses also come in for a lot of comment. Having a washing machine in the bathroom was really strange as was the lack of a bath, wrote one British woman who moved in with her Dutch boyfriend. The steepness of Dutch stairs and big windows in many older properties came in for a lot of comment as well. One expat even warned people to be aware of moving too close to a tram line because of the excruciating noise made by the machines which clean the tracks early in the morning. The alternative to public transport is, of course, cycling, which all expats seem to adopt enthusiastically. ‘I love how relaxed the Dutch are on their bikes. You see men in suits and women in fancy dresses,’ said a Bulgarian office worker. The 140-page book has been put together by DutchNews.nl and ACCESS to help newcomers benefit from the practical experiences of people who’ve already gone Dutch. A large part of the profit will go to ACCESS to help the volunteer organisation continue providing information and advice to expats.